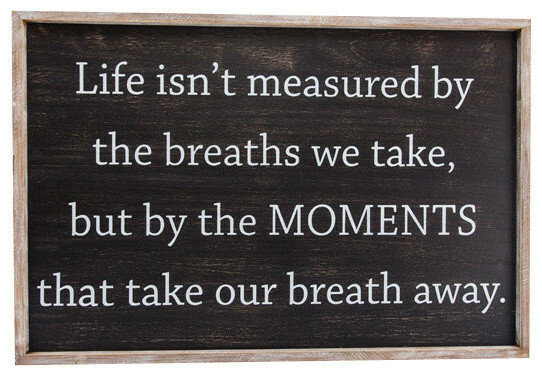 "Moments" Framed Sign - Contemporary - Novelty Signs - by Adams & Co. This 36" x 24" x 1.5" black & white framed sign (Model Number 18984) adds an inspirational and elegant finishing touch to your home or office decor. This product is a great way to fill an empty space and turn an ordinary interior design into a beautiful and contemporary one. In white letters on a field of black, the sign reads "Life isn't measured by the breaths we take, but by the MOMENTS that take our breath away." Committed to delivering their quality hand-crafted products to clients all over the nation, Adams&Co carries products that include everything from traditional home decor, to religious and seasonal decor that will give your home that one-of-a-kind feel and welcoming appearance. W 36" / D 1.57" / H 24" / 5.91 lb.